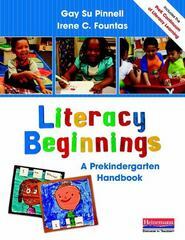 Literacy Beginnings 1 Edition For prekindergarten children, language and play are the major tools for learning about the world, and they are also the most important tools for early literacy learning. The three- or four-year-old who takes a memo pad and marker around to family members "to take orders" for dinner, like all young children, makes no distinction between play and reading and writing. It all involves curiosity, learning, discovery, and excitement. Watch an overview webinar! In their latest professional book, Gay Su Pinnell and Irene Fountas show you how to tap into young children's excitement to introduce them to the world of literacy in joyful, engaging ways. As with their Continuum of Literacy Learning for grades K-8, they provide detailed descriptions of language and literacy behaviors and understandings for teachers to notice, teach, and support, while offering practical strategies for the prekindergarten classroom. Full of resources like songs, rhymes, and finger plays, Literacy Beginnings also includes 35 ready-to-use lessons to introduce young children to reading and writing. Start reading now!